October is hands-down my favorite month of the year. All of a sudden the 95+ degree weather of North Carolina summer seems to be a distant memory–except when it is still present–and is replaced by cool nights and temperate days. The leaves change colors but don’t really clog up the gutters until next month. The sunset is still at a reasonable hour. You get the picture. October is also a month full of fun–beer festivals, fall festivals, The Barbecue Festival in Lexington, pig pickings and, notably, playoff baseball. Of course, October is not the only link between baseball and barbecue. Barbecue and baseball both take a long time, and for much of that time it appears to the casual observer that not much is happening. Experienced observers know that a lot is happening even when nothing is happening, or so we tell each other. Barbecue and baseball are consumed by many but fully appreciated by a relative few. Similarly, baseball snobs and barbecue snobs can be insufferable–I am both so I know. Making barbecue and watching baseball are perfect times to drink beer. Eating barbecue and playing baseball are inappropriate times to drink beer. The best barbecue restaurants and baseball stadiums are revered as much for their history as the product they offer. Barbecue is made of pork, baseballs are made of cows. There is often good baseball played north of the Mason-Dixon line; there is rarely good barbecue in that geography. 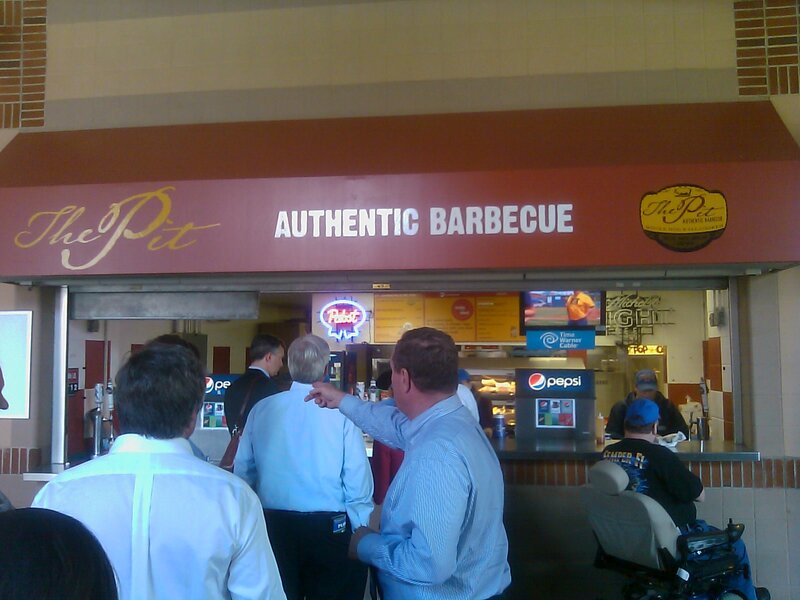 Baseball’s fan base is eroding, barbecue’s is expanding. There is no Major League baseball team in North Carolina. There are several major league barbecue restaurants here. *Yes, 18, not 20, as I feel the same way about the designated hitter as I do about gas/electric cookers. 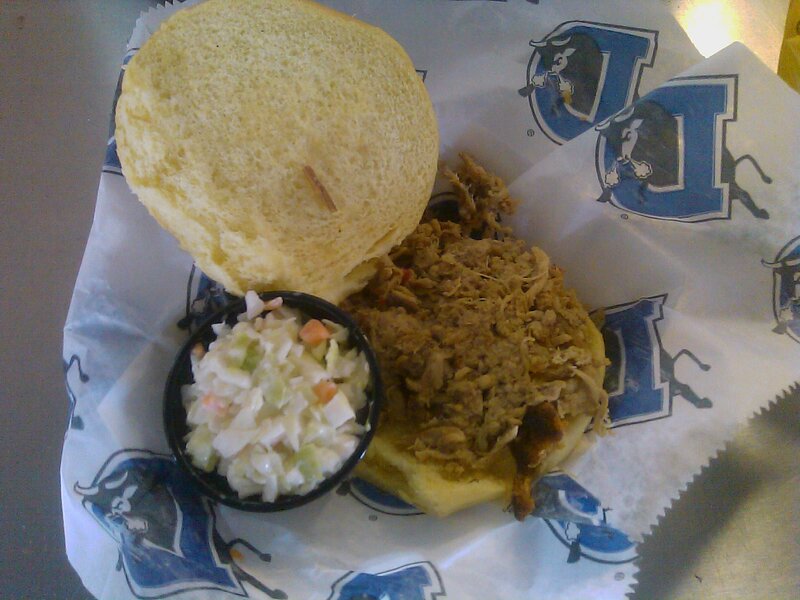 A picture of my too small, overpriced but fairly tasty The Pit barbecue sandwich is above. Note the crappy, from-a-plastic-container coleslaw, which is unforgivable. Still, better than an shriveled hot dog and a more than adequate representation of North Carolina barbecue; something we can be comfortable with the many out of town visitors to Bulls’ games tasting if it happens to be their first exposure to North Carolina barbecue. Do you know if BBQ was ever served during baseball games throughout North Carolina for any of the minor league farm teams? Is there any historical connection between barbecue and baseball in North Carolina, that you know of? It seems logical to assume that ballparks in Winston-Salem, Greensboro, Kinston, Burlington, and the like had BBQ at their concessions stands at some point. However, I’m only familiar with the relatively recent history of soon-to-be extinct (tune in Friday) Dillard’s BBQ in Durham offering food at the Durham Bulls’ concessions. Any readers know of additional BBQ-baseball connections in NC?